We were talking the other day my husband and I. About shoes. And about the places his ‘new’ shoes have taken him this year. The adventures they have been on with him. They’ve seen thousands of miles, and thousands of acres. Many steps. Puddles. Mud. Doors and floors. Of all the things we possess our shoes go with us almost everywhere – even to the last piece of concrete before we shed them to run barefoot on the beach! For poetics we can choose our form – ode, sonnet, haiku, free verse – but I would love to see us wax poetic about the places our shoes have taken us, the places they have seen and do it from their perspective! Many of you have closets full of shoes. Chose your everyday pair, or a pair that have seen many adventures with you. Use photos if you are able, we’d love to see your shoes (really!). 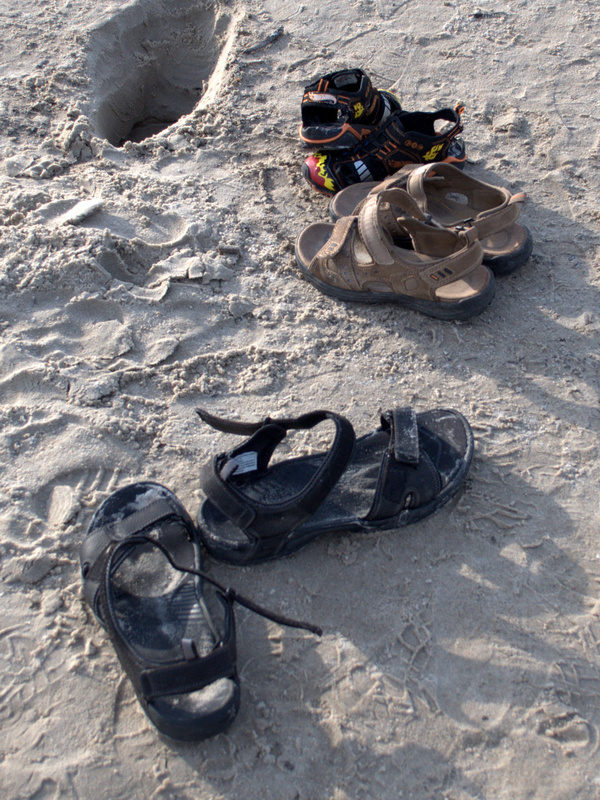 Here is a photo of our sandals waiting for us at the beach. My winter boots are dripping by the door and my hubby’s farm shoes are off to work with him. Welcome new poets, and welcome back friends! It is a pleasure to be tending bar again, and if your boots are dirty please leave them by the door! Oh and you have a few pairs of shoes, feel free to share more than one shoe story! The old saying about walking a mile in someone’s shoes to know them has a variation. If you walk a mile in someones shoes, you’ll be a mile away and in their shoes! Visit others, it’s a community thing. Fun prompt, Shanyn. It’s been busy for me, so I’m lucky to have one already in the files. Whoa! Glad you have something Victoria! We have a hockey game tonight so I’ll be checking in at random times to see the poetry and serve some ‘sock-tails’ to the pub goers! nice… have fun at the hockey game..
We had a great time, will post my poem for the prompt and read everyone’s poetry tomorrow! oh nice.. have fun… so who’s playing…? Will save you some treats for later my friend! I run Linux on my PC 🙂 gave me another few years of mileage on my 7 year old computer.. The poem in today’s list has had such an intense effect on me! Glad you are here, and so pleased you are looking to join in! thanks for visiting abhra…i look forward to your entry…. So glad you are enjoying it Claudia! We were at the beach, by a hole one of the boys dug, and we took our shoes off to go into the lake. I was laughing because mine were orderly and the guys were just random in their rush to hit the water! ha. def sounds really familiar shanyn…. 😉 your secret is safe with me! ugh.. sounds stressful… hope you find some time to read in between.. Sounds like you’ve been busy! Glad you are here, and hoping your shoes inspire you some. Can’t wait to read everyone’s poems. Me too – looking forward to catching up later! smiles. thanks for being here freya…. great prompt shanyn…you probably dont know this but we did shoes about 2 1/2 years ago….so you gave me some good memories of the pub to look back on as well….it was one of the first prompts we ever did…had fun with this…smiles. I had no idea Brian! That’s pretty cool. This one came out of a chat my hubby and I had about his ‘not so new’ new shoes and the places they had been this spring, summer and fall. Cool that you went down memory lane like that! it was very cool to revisit so i didnt say anything when you sent it to me…shoes have always told a story for me…so there is plenty of poetry in them…. I think it might be nice to repeat some of the prompts that were issued before many of us joined. This is such an interesting & fun prompt; but as per Brian’s comment, there’s noting new under the sun, just varying perspectives. I got hooked on the concept of military boots, where they’ve been marching through historic wars; but your prompt opens up the possibilities immensely; thanks for your imaginative challenge. yours was a very cool trip through history of the boots our military wear….sad to see the ones by the rifle…. Looking forward to everyone’s thoughts on this. And i like the idea of somethings being new while most others are reborn in some way! Something about their shape, and the memories of walking, running, dancing in them…. Nice one for a Saturday night, Shanin. Your comment was so poetic Aprille! Loved it! Shanyn, I really enjoyed your prompt. I wrote about my standard summer shoes, which would be a bit ‘chilly’ to wear this time of year. Smiles. It was a toss-up between Tevas and cowboy boots, and Tevas won. LOL. I will enjoy visiting what other people have written. I’m torn about which ones to write about – might be a set! 🙂 Glad you enjoyed this! ALright, be back in a couple hours…heading home from the holiday today…will catch up when i get there with those that are visiting…. be safe on the road bri.. Thank you for the prompt Shanyn! Hope you enjoy the hockey game. We had a great time – it was a tie game at the end and then lost in the over time in 18 seconds. Will check in to read poetry in the AM! This post makes me want to sing, “I could walk 500 miles….” Thank you Shanyn off to go pick a pair of shoes. I walk a lot~ Have fun at the hockey game-sounds fun! oh nice…both of you have got ear worms going in my head now…smiles. I LOVE THAT SONG! What a great tune to have rolling through my head! Better than Nancy Sinatra i suppose! Shoes – that which protects our sole (soul), containing the word she – the Great Mother. Great idea, Shanyn! I’ve been traveling for 17 hours today. I’m almost there –2 more hours … My brain is tired, my body is too. My shoes seem to be status quo, though. I’ll think about shoes. Hopefully something will be written tonight before the jetlag kicks in. omg…where are you travelling from? if this coming back from the holidays? I traveled from Norway to Whistler, BA, Canada. No holidays yet, I’m here to attend a work meeting. wow that is a ways to go for a work meeting…. Yeah! That is life somedays, but I think I will enjoy. You got to Canada and are still half a country away from me! 😦 Enjoy your work stay, it’s sure pretty out there! Will check in on your writing when it is up! I did not manage to write last night, but did it today. I am off for some hours, but will come back and make the rounds. Hey Shanyn–I’ve actually written a fair amount about shoes in the past–including one here re shoe letter–one to the other. I’ve had a very hard day and don’t think I’m up to this one (unless I repost another poem), but it is a very provocative prompt. Do you know that “shoe” is (I think anyway) often a child’s first word? K.
Well, they are also early words. I’ve always heard that Dad is earlier than Mom because Dad is more clearly “other”. And maybe it’s changed, but shoes used to be an early word because children were getting their first real pair about the time that they learned also to speak so that it would be this very exciting thing. This may be all old school though–maybe kids get shoes earlier now –I don’t know about that part. I know that it used to be at least very exciting to get first pairs of shoes actually used for walking. I remember my first daughter particularly being just thrilled. At that time, all of lower Manhattan would go to this one guy’s shop on Avenue B. k.
very cool…and makes sense as well…imagine all the new brain pathways needed to leanr to walk as well…. do we really have to photo our shoes? I have just completed 4 hours of gardening and I can’t – just can’t pull them all out – fun prompt though Shannyn – I do enjoy the – whimsical ones – happy writing all! ha. no you dont have to picture your own shoes…smiles…4 hours of gardening…goodness…do your knees hurt? smiles. no but my bum and hands do!!!! A couple of details in my poem are true, but I cannot remember which ones. Fun write. Shoes are of great importance to me. i think you will find though that if you do there are quite a few giving people here that will gladly give you a read. smiles. Coffee – check! Boys busy with a new Lego book – check! Poetry linkie open – Check! I’m off to read, and comment, and yes WRITE my poem for my own poetics! 🙂 Good morning my dVerse friends! smiles… sounds good… good morning.. I know you do! 🙂 It is the history of the MiniFig book with three exclusive figs! They are loving it! I absolutely loved this prompt, and used it for a bit of dreaming! What fun. Thanks everyone who shared a poem, and to those who visited the other poets who shared here. That’s what makes this a community – spending time together here and on our blogs.